I sat down today and got three cards done....wham, bam, thank you ma'am! All 3 of these were done in less than a couple hours. And it seems I was in a "krafty" kind of mood....because all 3 have kraft cardstock in some form. Hee! This first card uses Sweet Sunday Sketch 70, and Cricut Cardz Challenge #25 to use birds or butterflies on your card. Isn't that butterfly fabulous?! It is from the Hannah Montana cartridge....I know I say this about every cartridge, but this one is a keeper. You don't have to be a Hannah Montana fan to love it...because I certainly am not. It just has a lot of fabulous alpha & shape cuts on it....and very few would pertain only to Hannah Montana. Here is the card! Instructions: Fold patterned paper in half to make card base, and round the right side corners. Round the right side corners of a kraft cardstock block, and adhere to the front. Glue three paper flowers to the left side of the kraft block. Stamp the sentiment to the lower right corner. Cut the butterfly and its layers at 1.5" using the Cricut Expression & Hannah Montana cartridge. Glitter the pink layer, and then adhere together. 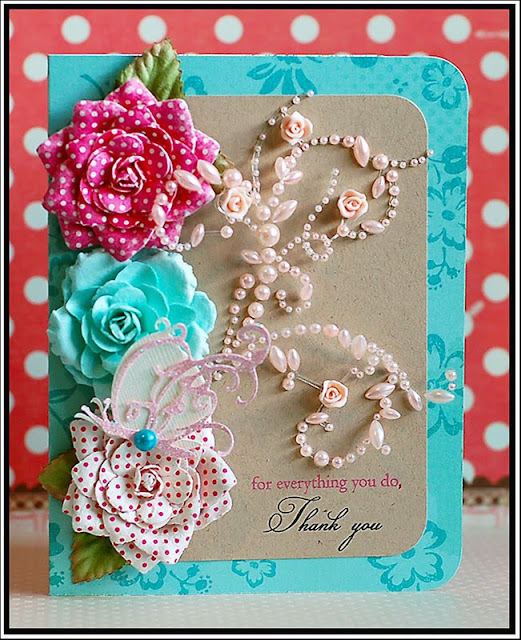 Attach to the top of the bottom flower, and accent with a teal pearl. Add the pink pearl flourishes as the butterfly flight pattern. This next card uses 365 Cards: Sunday Sketch and The Pink Elephant Challenge #68 to use mostly orange on your card. Broke out a white pen on this one....haven't done that in a long while. Love how it turned out...I see myself using my white pens a lot more in the future! Instructions: Fold kraft cardstock in half to make card base. Cut the sunburst at 5" using the Cricut Expression and Graphically Speaking cartridge. Adhere to the lower left corner, trimming the excess from each side. Cut a circle from heart paper, ink the edges, and adhere to the middle of the sunburst using dimensional adhesive. 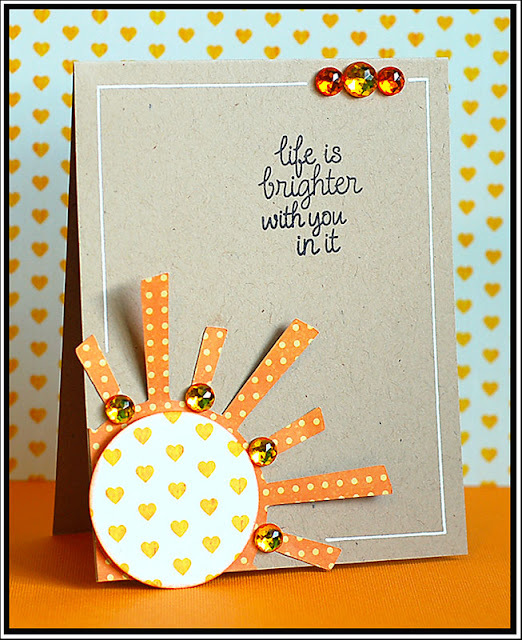 Accent the sunburst with jewels, and add three jewels to the upper right corner of the card. Draw the white line around the card using a ruler and white Uniball Signo pen. Stamp the sentiment to the leftover white space. And this last card is for the 365 Cards: Keep It Simple challenge to use one stamped image, one stamped sentiment, and one embellishment. This card is actually pretty teeny...is is 3.5". Instructions: Fold kraft cardstock in half to make card base, and round the lower right corner. 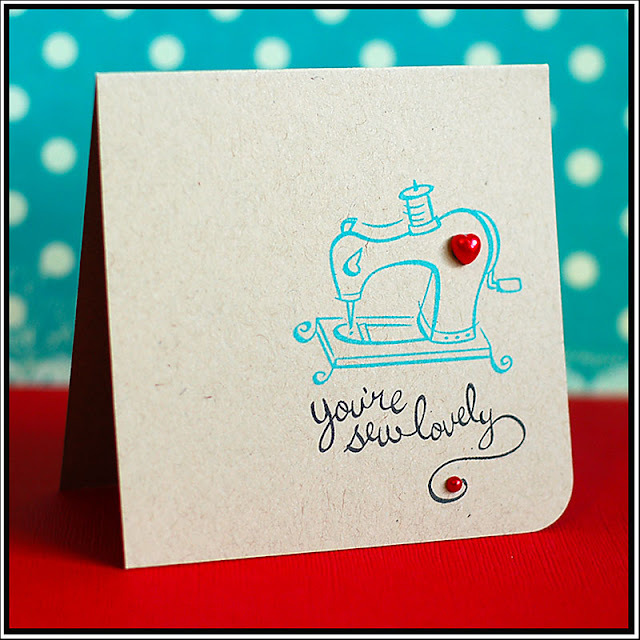 Stamp the sewing machine and sentiment to the right side of the card. Accent with red pearls. Those are all the cards I have to share with you today! On the brother front....he had the Senior Awards & Scholarship banquet last night. He was awarded as "Sportsman of the Year" and recognized for being the only male in his class to participate in 3 sports all 4 years of high school. He also received $900 in local scholarships to add on to his $16,200 renewable scholarship from Carroll College ($8200 athletics, $8000 academic). Needless to say...we are SO SO proud of him. Wish I could have been at the banquet to hear it all in person. They were pretty good! 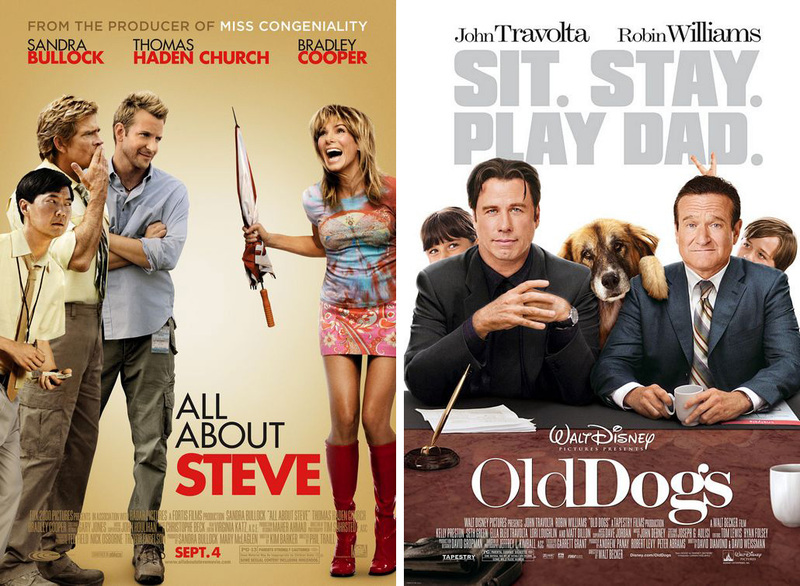 All About Steve wasn't as funny as I thought it would be, but it was actually very heartwarming. I liked it. And Old Dogs was hilarious...loved it! It was pretty heartwarming too. So- we had a warm and fuzzy movie day together! Tee hee! These are fabulous! last week I lost my internet and my mojo. I have internet again, am trying to get some mojo, thanks for the inspiration! These designs are so great, Lea! I love what you did with the prima flourish! I am so loving the sunshine card! Think I might have to case that one! I saw the sketch yesterday, hmm what shall I do!? Thanks for palying along with us over at the CCC blog! Ohhhhh, AMAZING cards, all of them. I'm picking up my jaw from the floor as I write. Wow! You have been quite busy, Lea! All your cards are soo beautiful and fresh. Love your crisp take on the sketch... really love it! So much krafty goodness here. Each one is special. And I always like your movie recommendations. I don't have much time to look for movies to watch. You had a fabulously creative "krafty" day!! These are marvelous and I love every single one! Congratulations to Casey. That's so amazing!! Oh my! What beautiful cards....just gorgeous!! Wow! major bling on the "Everything you do" card. So lovely. Especially like how you glittered the butterfly. Great idea. Lovely little orange sun!! Thanks for sharing with TPE this week!! Those pearl accents are to die for!! Very beautiful, as always! WOW! All of these cards are stunning! Accordian Flowers with GCD Studios!